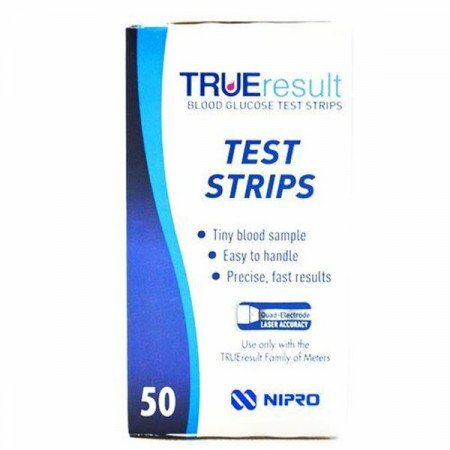 True Result testing strips are used for the monitoring of blood glucose levels by diabetics. Both type 1 and type 2 diabetics need to monitor their blood glucose levels regularly in order to control their condition. The testing strips need to be used in conjunction with a glucometer as this is the device that measures the enzymes in the blood to determine the amount of sugar in the blood. True Result strips are easy to use and provide accurate results when used correctly. Always follow the manual on your glucometer to make sure you’re using it properly and getting the most accurate result possible. What are True Result testing strips? True Result strips are used by people with diabetes to check their blood glucose levels at various points throughout the day. They can be used by people with type 1 and type 2 diabetes in conjunction with a glucometer (blood glucose meter). The strips react with a chemical in the blood called glucose oxidase which is then measured by the glucometer using an algorithm. Within a few seconds, your blood glucose level should show on the screen. True Result testing strips help people with diabetes become more aware of their blood sugar levels, whether their medication is effectively managing their condition, and whether they need to do anything to raise or lower their blood sugar. Can I use True Result strips more than once? No. Each strip is single-use only and must be disposed of immediately after use. How do you dispose of blood test strips? As the strip contains a bodily fluid, you shouldn’t just throw them in with the household waste. You should dispose of your testing strips in a sharps bin which can be prescribed by a doctor and then returned to your pharmacy for proper disposal. Some councils provide sharps bins free of charge, so it might be worth checking with your local council before making an appointment with your GP for a bin. How many times a day do I need to use True Result test strips? The amount of times you check your blood glucose levels will depend on what type of diabetes you have as well as what medications you’re on. People with type 1 diabetes might have to check their blood glucose levels more often than someone with type 2 diabetes, but generally you should test your blood at least twice a day, if not more. Your GP will be able to advise you on the ideal amount of checks for your condition. To check your blood levels properly, you need to know your target range. This can vary depending on your normal blood glucose level and the type of diabetes you have. Please speak to your doctor about what your target range of blood glucose should be so you know whether you should lower or raise it accordingly. How do you use True Result testing strips? True Result testing strips are easy to use, with results in a matter of seconds. Before using the testing strips, wash and dry your hands, making sure they’re completely clean. If you don’t do this, your blood might be contaminated with whatever is already on your hands which may give a false reading. Blood for glucose testing should always come from a fingertip unless your device states otherwise. Turn on your glucometer and insert a true result test strip into your glucometer. Prick your chosen finger with a lancet and squeeze it until a drop of blood comes out. Touch the blood with the end of the test strip – it should soak it up. Wait for the result on the glucometer. Depending on your blood glucose level, you might need to take steps to raise or lower your blood sugar. Your doctor or pharmacist will be able to advise you on what to do in either of these situations. Are True Result testing strips accurate? The accuracy of your results usually lies in the glucometer rather than in the testing strips, but True Result is a trusted and high quality brand, meaning that your results should be accurate every time depending on the quality of your glucometer. Temperature: glucometers tend to work best at room temperature. Try to make sure your device isn’t too hot or too cold. Humidity: this can affect the accuracy of the result. Keep your glucometer and testing strips as dry as possible. Too little blood applied: testing strips need to take a certain amount of blood to achieve an accurate reading. Although it might not be pleasant, make sure enough blood comes out when you prick your finger, or else you might have to do it again. Expiry date of test strips: yes, plastic strips can expire. For the most accurate results, make sure your testing strips are still in date when you use them.